Described by director Jacques Demy as ‘a film in song’, the visually intoxicating The Umbrellas of Cherbourg [Les parapluies de Cherbourg] pays homage to the Hollywood musical in this masterpiece of 60s French cinema. Guy Foucher (Nino Castelnuovo), a 20-year-old French auto mechanic, has fallen in love with 17-year-old Geneviève Emery (Catherine Deneuve – Belle de Jour, Potiche), an employee in her widowed mother's chic but financially embattled umbrella shop. On the evening before Guy is to leave for a two-year tour of combat in Algeria, the pair share a passionate night. Geneviève becomes pregnant and then must choose between waiting for Guy's return or accepting an attractive offer of marriage from a wealthy diamond merchant (Marc Michel – Lola). The film was scored by legendary composer and three-time Oscar winner Michel Legrand, who went on to work on films such as The Thomas Crown Affair, The Go-Between and Yentl. The Umbrellas of Cherbourg won the Palme d’Or at Cannes in 1964 and the newly restored version premiered in Cannes Classics in 2013. Now the film has been fully restored for DVD and Blu-Ray with over four hours of extra features, including many new and exclusive to this release. 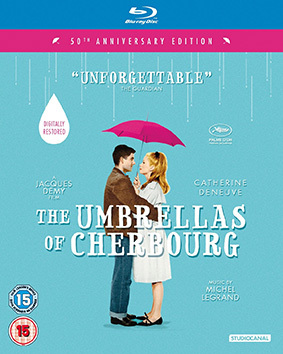 The Umbrellas of Cherbourg will be released on UK DVD, Blu-ray and EST download as a 50th Anniversary Edition on 10th February 2013 by StudioCanal at the RRP of £15.99 for the DVD and £22.99 for the Blu-ray. This will be the film's UK Blu-ray premiere.